For 25 years, Ray Ellis donated prints depicting classic Vineyard fishing scenes as a fundraiser for derby scholarship fund. For 25 years it was an anticipated event — the arrival of the limited-edition prints depicting classic Vineyard fishing scenes as rendered by artist Ray Ellis. Money from the print sales went toward the derby’s scholarship fund, which helped students pursue studies in marine sciences. Over the 25 years, the program raised more than $500,000 for the scholarship fund. But derby president Ed Jerome and Mr. Ellis always knew the painting series would come to an end. “It gets saturated,” Mr. Jerome said this week. “I mean, 25 paintings is a lot for everyone to have.” So he and Mr. Ellis set the end date and decided that they would then make a book featuring the scenes. They began work on the project two and a half years ago. The book was thirty per cent done when Mr. Ellis died last fall at the age of 92. And Mr. Jerome knew he had to finish it. “I had bits and pieces of it here and there in my boxes of things I was collecting,” he said. “And I knew that it was important to finish, and if I didn’t do it, it wouldn’t get done.” He woke up at four each morning and worked until 10, finalizing every detail from the typeface to the color of the book jacket, and collaborating with the director of Ray Ellis’s gallery, Treesa Germany. Contributors Bailey Norton, Ed Jerome, Ray Ellis and Matthew Stackpole. An Amazing Story of the Vineyard’s Derby is actually many stories folded into one. Each painting features an accompanying essay. Some are fictional pieces, others short musings and still others are historical notes. Put together, the essays paint a vivid picture of the impact fishing — and fishing on the Vineyard — can have on a person’s life. “It’s about the Vineyard’s history, in a way,” Mr. Jerome said. But it is not a history of the derby itself, he said. It wasn’t meant to be. Mr. Jerome reached out to both the Island community and the fishing community to gather the essays. Bailey Norton writes about the Edgartown Lighthouse. Everett Poole contributes a piece about Menemsha. Spider Andresen remembers fishing in the bunker, and Bridget Tobin describes the old Islander ferry. “They’re just really, really neat stories,” Mr. Jerome said. Reading the stories and researching what photos might accompany the text was a highlight of the process. “It just made it wonderful because I was learning as well,” he said. But the best part of the project was not the book itself, Mr. Jerome said. It was 25 years of collaborating with Mr. Ellis. 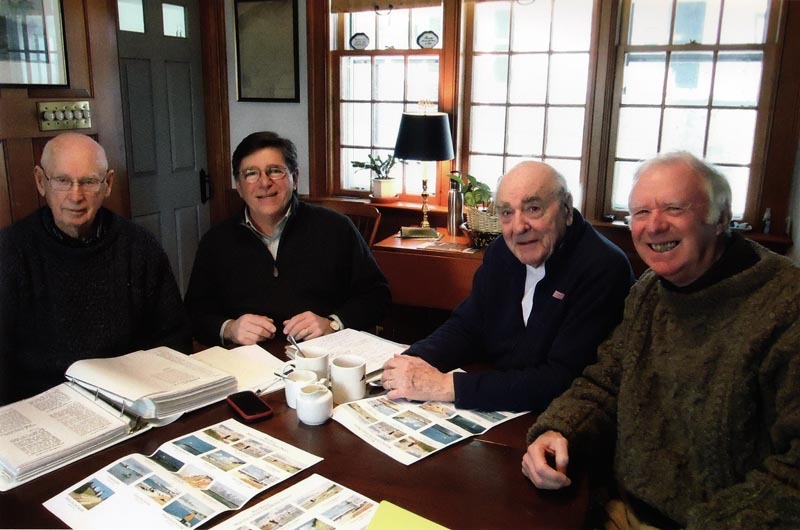 Mr. Ellis never fished the derby himself, but he was immediately on board when Mr. Jerome and derby committee member Arnold Spofford approached him about creating the annual painting. The first print, Wasque Fishermen, was released in 1987. Each print was numbered and signed by Mr. Ellis, who initially suggested a run of 300. The number was reduced to 100, making the prints more collectible. Wasque Fishermen was the only print Mr. Ellis hung in his own home. New book was labor of love for derby president Ed Jerome. “I am so thrilled to have it, since the Wasque I painted twenty-five years ago is no more,” the late Mr. Ellis wrote in his forward. Part of the appeal of the book is an extension of that theme — capturing the Vineyard landscapes during a given moment in time. Exactly two decades later, Mr. Ellis’s painting was of the Norton Point breach, the fissure that changed Wasque forever. Over the winter, Mr. Ellis and Mr. Jerome would meet to discuss what the next year’s painting would be. The spot was carefully researched and planned, and the final painting had to meet certain criteria, as a passage in the book’s first essay notes. “On each, we used the same measuring stick. Was it authentic? Did it capture the essence of the special fishing spot? Did it have a recognizable Vineyard landmark in the painting? Was Ray pleased with his work? And finally, would it be universally enjoyed by folks not familiar with the derby and the Vineyard?” he said. Mr. Ellis went out to the sites with his camera in tow, snapping the photographs that would be the basis of the painting. Mr. Jerome served as, in his words, “the Vanna White,” standing in a spot and pretending to reel in a fish, or to hold a striped bass just so, or to cast a fly rod across the water. Mr. Ellis then made sketches and created his final image. 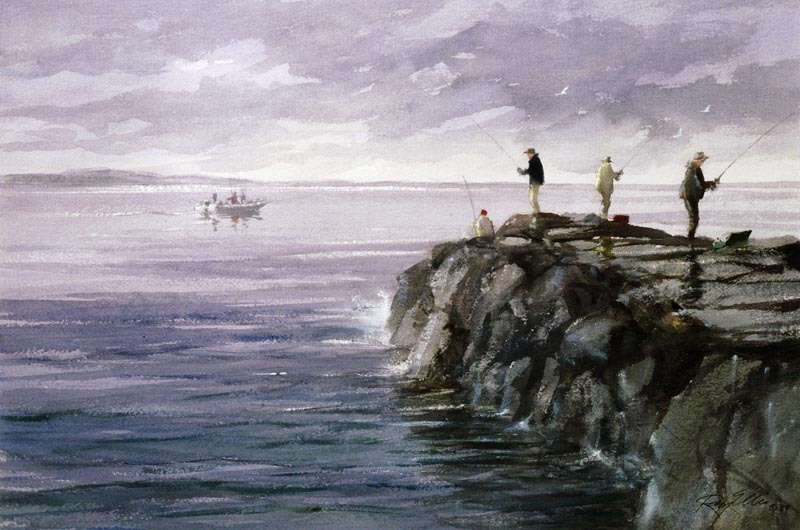 While working on Rite of Passage, the 1995 painting that features a father and son walking beneath the Gay Head Cliffs, the bass Mr. Ellis initially painted was too small. He had to adjust it to be a regulation-sized fish. The final painting in the series is of the Cape Pogue Lighthouse. The painting has no people in it, just a sandy path stretching upward and culminating in the light. It’s titled The Journey’s End, and it’s Mr. Jerome’s favorite. 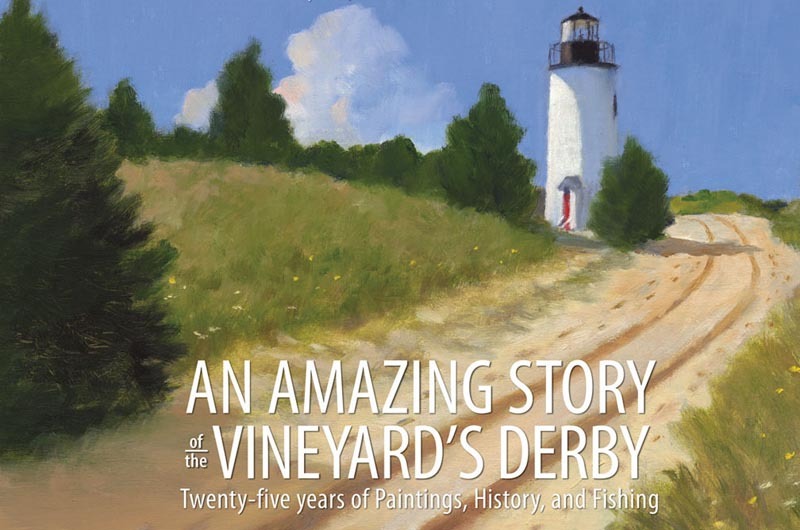 An Amazing Story of the Vineyard’s Derby, by Ed Jerome and Ray Ellis, is available at Bunch of Grapes, Edgartown Books, Vineyard Vines, Coop’s Bait and Tackle, and Larry’s Bait and Tackle.